Let’s talk body butters. These are thicker, richer older cousins of typical lotions that are built on a base of cocoa butter or shea butter. Honestly, a good body butter should have few other ingredients. Over the years, I have attempted to get on board with body butters but the texture has been overwhelmingly greasy or the scents off putting, or worse both. But last year (yes, also on a trip to Disney) I discovered Basin. I get migraines with most scents (walking through the mall side entrance of most department stores will trigger a violent migraine as will being anywhere within a football fields distance of a Yankee Candle Co.) and the most notably thing about entering Basin was that the aroma did not make me run out of the store screaming “Save my head!” I tried the sample of the body butter in a few flavors and the texture was rich but not greasy and the smell was absolutely delectable. Notably, I headed out of the store that day with both the peppermint and the almond. It was hard not to buy three or four more. None of the scents were off putting to my scent-sensitive nostrils. Almond (and you will here more about this in the days to come in the Refresh for May series) is absolutely my favorite scent. It is an old stand-by for this migraineur who sometimes just can’t take the unscented everything from deodorant to cleaning products. 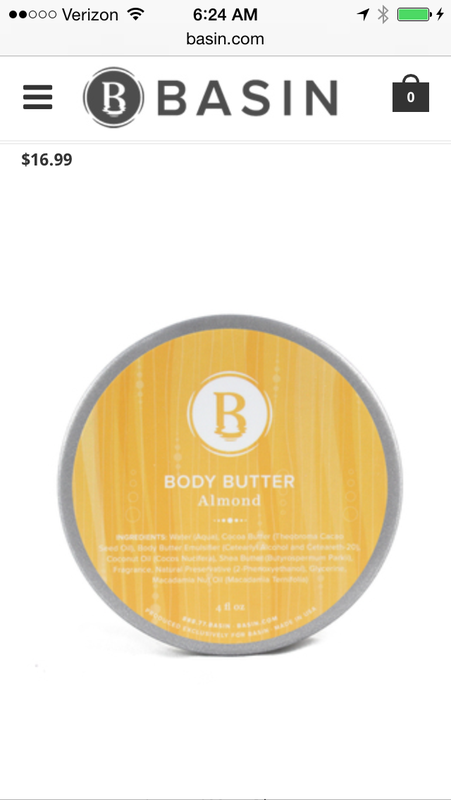 The Basin Body Butter almond smell was the purest, most unadulterated almond smell I have ever encountered in something that was not an actually pot of muddled almonds, a bottle of amaretto, and a roll of marzipan. It really is amazing. The peppermint was also a very pure scent that had a nice cooling effect to boot. I gave a tub of this body butter to a number of colleagues for holiday gifts this past year and the feedback was superlative for all scents and the unscented. This stuff is good. It cured dry skin ailments that had beleaguered some friends for years. I think it’s because this brand has both an abundance of cocoa butter and shea butter and little else. Alas, it is hard to come by in person. There is a store in Downtown Disney and on the Strip in Vegas. But you can order (like I did last week and if you bulk order and divide the shipping costs per containers it’s not that bad. This entry was posted in Beauty, Skin Care and tagged almond oil, almond scent, Basin, body butter, cocoa butter, Downtown Disney, dry skin, Las Vegas Strip, shea butter by surgeoninheels. Bookmark the permalink. I went to your website intending to catch up on the last few entries since I’ve been offline on vacation for the last week, and it only shows “featured” posts, with no way that I (in a few minutes) could find to sort chronologically. Thanks for the feedback. We are technologically illiterate novice bloggers. I have added the recent posts and archives to our side bar. I hope this helps. Thanks so much for following. The post a day of simple quick reviews is a new thing for us so the feedback is appreciated.